Dad has lived at Granite Gate for five years. He really loves his apartment and the staff, they have become like family. They are always so friendly and caring. I know I can go on vacation and not worry about dad, he's in good hands! I suggest you visit Granite Gate to see the lovely building and surroundings. I highly recommend Granite Gate! I liked Granite Gate Senior Living, but they're just too expensive. The food was great. It's upscale, and it's very clean. They have a lot of activities, but I didn't see a lot happening. They have trips to town, events in town, hairdressing, games, cooking classes, and a whole variety of things. It's very large and modern, and it facilitates all stages. Granite Gate was wonderful. I wish my mom could be there, but it didn't fit her needs. They're not geared for behavioral Alzheimer's. I was sad because I really loved the place, and it was absolutely beautiful. They had very nice people, so I didn't have any complaints about it. It was very warm, and wherever I was, they greeted me. It was really pretty and what I liked most about it was the memory care didn't look like a convalescent hospital and was really nice. They had a little garden area for people who like gardening, which I was impressed with, and activities scheduled all the time, like exercise. They had good food. My mother is at Granite Gate in the Bridge to Rediscovery, which is the memory care unit. It's a big community. Her room is divided into two rooms, one on either side of the wall. Basically, it is one room with wall in it. They have done really well. My mother likes doing the gardening and yoga. I have not eaten there, but she said the food is very good. Granite Gate was very nice. The rooms were spacious. The whole place was very nice. The dining room was very nice. They had very good selection. Granite Gate Senior Living was super clean and nice. It had more prestige in the sense that it was very beautiful. It's a facility for people who like socializing and being with a lot of people. Granite Gate was a converted hotel and not as affordable as other places. As far as safety for my mother-in-law goes, I saw a greater risk of her falling there. It’s very nice and very upscale. It was out of our price range and definitely a five-star facility. It definitely has all of the safety features in place, but, for her, she would not self correct and take the safest route. It’s not the facility; it's her. The financial aspect was a barrier for us. Thank you for visiting Granite Gate Senior Living and we are glad you liked our community. We understand that cost is a concern when you're looking at senior living options. While senior care housing can indeed be costly, many elderly people's needs outweigh the costs. Because many families are facing this dilemma, we at Granite Gate are committed to working closely with you to identify the best possible funding options and finding ways to overcome financial barriers. Please contact us to discuss your specific situation. Granite Gate was a little dated and wasn’t as upgraded as other place, but it’s in a beautiful setting. The rooms weren’t really ready for us when we got there, but the lady who showed us around was very friendly and very accommodating. My parents liked this place better than I did. We loved Granite Gate. It was more of an upscale place. The staff was excellent and all very helpful. The rooms were very nice, modern, clean, and spacious. It had one common dining area; I would have preferred two or three dining rooms for variety, but it was nice. The common area was very nice down near the entrance and had a beautiful setting. I thought they were a bit limited in activities. I went to Granite Gate. The staff was very nice. The program they had was only for the residents. I was looking for an adult daycare and a memory care. They had a fine program, but it was only for the residents. I saw one furnished and one unfurnished room. As I recall, they were pretty large, with safety features everywhere. There was a big patio door, so there was plenty of light coming in. I thought it would be alright, but it was out of my price range. I liked how caring the staff seemed to be. My mother-in-law is moving in the middle of October into Granite Gate. The person who showed us around did a very good job. We ate there -- we probably were there four or five times during the week just to keep going back and seeing -- and she didn't care, she encouraged us, and they've been very good. We liked the environment there. It seemed that the residents socialize with each other, and there were things for them to do. It didn't seem so institutional. Granite Gate was very nice. It was well kept up. Their staff was nice. The food was good. They had arts and crafts, music, and exercises. They had a lot to do. The rooms were really nice. It was actually on the fancier side. They made everybody feel good and welcomed. They were very friendly. My both my parents stayed at the memory care at Granite Gate, and that was an amazing place. The thing that I liked most about it was that the entrance had the living room with a fireplace. They had a cocktail hour there and had newspapers for people who just liked to read and hangout. One of the most remarkable things in terms of staffing was that the person who was manning the entrance desk area was fabulous. She knew everybody's name. She could handle the phone, talk to a client, and answer my question. To me, that was extraordinarily important. The other thing that was interesting in this entrance was that they always had ice-cold water with lemon. Every time I went in there, I had a glass of water. There was a large activity room for the independent and assisted living. They had a cocktail hour, somebody was singing, and if people want to dance, they could dance. Sometime after an activity or doctor's appointment, I would take my mother in there and sit down because she loved music. For memory care, as long as I was with her, she could be there. I would have a glass of wine, and she would have some food and had some music. For me, it was great that they were flexible. The director on the unit was super, and the staff was so attentive to her and so terrific. They also had a nurse there that run the medical and all the units of the memory case was one of the most fabulous nurse in the world. She is super and on top of everything. The food was super and was cut-up before it was placed on a plate. So, all you had to do was put your fork in it, poke it, and eat it. They gave two choices of food, or you could have a hamburger or cheeseburger. They would put two protein, a couple of vegetables, and homemade soup with water on the table. My mother really love that. All the food were homemade. They had a baker and a chef in the house, and the snacks were super. I really like Granite Gate Senior Living for my mom. I like the convenience of the location. I also like the facility and the fact that the assisted living residents are mixed in with the residents. The staff is very friendly. I have had good interactions with the caregivers, and they are very concerned about her wellbeing and what to do to make sure that they are assisting her the best way they can. We were able to have a visit at Granite Gate Senior Living and that was very nice. The staff were very eager to help and to give information. The rooms were small, but they were okay. They were very clean and very neat. Their dining area was nice and cozy. We went to Granite Gate. This is the place my mom wants to go when she is finally OK to go in a facility. It was like walking into a resort and not an assisted care facility. The rooms were almost like apartments style living. It is very nice, very comfortable, and very clean. It has its own bathroom and kitchenette. We actually ate lunch there, and the food was phenomenal. The dining room is like walking into a resort. They have many activities. They have activities there on location as well as field trip type activities offsite. It is very well organized. The people that lived there is really what sold our family on it because they were so happy. Their comments were completely unsolicited, and they were all very happy with living there. It was just more like a community. The staff people of Granite Gate Senior Living were helpful. The rooms were more like the resort type, and the dining room was more upscale. I did not notice anything that would cause me to think that the place was unsecure. We like Granite Gate Senior Living when we went to the facility. This facility is something worth considering should we need them. I like them because they do have procedures for food services per eating, and they treat it as a restaurant facility. The residents eat at the same time. We had dinner and their food is good. They do have all kinds of activities and different exercise programs. They also have a regular bus service schedule to go shopping. You also don’t have to change your room if you go from assisted living to more intensive care. They would provide the services there. I liked the location of Granite Gate. It was very close to my work. The staff was very friendly, helpful, and answered all my questions. They told me what they would and wouldn't be able to provide. The rooms were spacious, and the views were great. Granite Gate was very nice. It's a little more showy. When you walk in, they have a frame that has your name in it that says you're showing up today and welcoming you. The residents there, too, seemed a little more on the snobby side. The staff and everyone were very pleasant and they greeted other people in the hallway. They all seemed very attentive. It's just not what I'm looking for. Granite Gate Senior Living is an incredible facility. It came recommended by a number of other people who have had parents who were actually in the facility. I visited a couple of others too, but once I saw Granite Gate, it was kind of my standard. It was a beautiful place. It was absolutely gorgeous. The surroundings were nice. This facility sits up on a hill, and it is reasonably wooded. There are a lot of trees, and it is just a very beautiful site. My first impression was that this is the kind of place I would spend a fair amount of time at. With regards to the staff, I was impressed with the support that they were providing their residents. They were very focused, very friendly, and caring. Although they were professional, they were very professional in a very caring way. I had two meals for that day and food was excellent. The dining room was open, spacious, and really nice. It was like an enlarged home feeling. They have a workout facility, a walking path, and a library. They had groups that you could spend time with, and they had exercises classes too. They had everything that I thought I would need. I could also bring all my own stuff too. Granite Gate was very nice and very gracious. They showed us around and answered all the questions. We visited a year ago. This is the second time we visited, and the food has gone down a little bit. They didn't seem to have as many vegetarian dishes. So that was the problem for my mother. But it's wonderful. The rooms were very nice and bright. They have games. I think they have Bible study once a week, and they take residents to their churches if they want to go. It was just a beautiful place. It didn't seem too much like an institution. Granite Gate Senior Living looked very nice. The people we dealt with there were professional and courteous. They took time to answer our questions. We were treated well by the sales staff. We were provided the information. We were also able to view the potential rooms. We only looked at a studio room and we found that it was bright, that it was laid out well, and it had all the things we would want if we're going to use the facility. We didn't really have any concerns about it. This institution really impressed me. It is set in a beautiful setting, the different areas are decorated well and uplifting and the hostess showed us around very adequately. We asked a couple of the residents about the food and they said it was great. We saw one studio apartment and really liked it. In fact, our relative is going to go there as soon as there is an opening. My mother is a current resident of Granite Gate and although it was difficult for her to leave her home, she has adjusted to her lovely apartment. My mother was amazed that everyone knew her name, smiled, and offered her assistance whenever she left her apartment. Mother has not been without a family member since our father died, nearly 20 years ago, and now she has new friends and activities to fill her days. My sister and I visit multiple times a week and I have only witnessed patience and caring to the other residents as well as to my mother. Whenever I have had a question or concern the staff at Granite Gate have swiftly addressed them with courtesy. On one occasion my mother had stumbled in her room while I was speaking to her on the phone. She began to cry and I quickly got off of the phone and called the front desk. A care giver was dispatched and I received a phone call from her room with a report that she had only frightened herself. Granite Gate is a beautiful community and well maintained. I don't think of this community as a "placement" for an aging parent; I can truly say it is a wonderful home for my mother. I recently moved my 87 year old mother to Granite Gate. I found the marketing intake director, executive director and rest of administrative staff including medical and care taking assistance, compassionate, caring, professional and made the move and transition for my family and mother a seamless process. The facility is beautiful (resort located in the Granite Dells with beautiful views and landscape) and very warm for the residents and also for family and friends when visiting. It is such reassurance to know that on a daily basis all of my mother's needs are tended to from her safety, personal needs and medical needs along with caring professional staff. Making the decision to move a family member into an assisted living facility is not an easy one. I must say that the entire staff at Granite Gate made our decision easy. Our entire experience was wonderful - from the incredible views to the genuine caring attitude of the staff. I would highly recommend this place to anyone considering an assisted living facility in Prescott! I recently moved into Granite Gate with my spouse and am VERY happy. I visited several facilities in Prescott on numerous occasions (and interviewed residents in those facilities) from 2008 through the present and after that extensive research determined that Granite Gate best suited our needs. The facility itself is beautiful and is located in a gorgeous setting. All the apartments are quite spacious, have patios/balconies with gorgeous views, and include kitchens (albeit small). The staff have been very accommodating, caring, and helpful. The residents I have met are active and involved with activities at the facility and seem quite happy. Choosing to live in an assisted living facility can be a difficult decision, particularly for those who have been fortunate enough to own their own homes and enjoy complete privacy. Assisted living requires that people interact with others in ways they may not have done in many years, particularly if they have lived alone and without help. These adjustments can be difficult at ANY facility regardless of the number and quality of the staff. Granite Gate makes every effort to assist residents while at the same time respecting their privacy and their individual needs. Obviously no one rating this pace has spent a enough time visiting the dependent side of Granite Gate. There are not enough caregivers. The residents don't look happy, and there is a lack of compassion and patience with the residents. Too many extremely young and inexperienced caregivers. I am currently looking for a new assisted living facility for my relatives. This community is set in the lovely Granite Dells near Prescott and has a beautiful setting. The property is a remodeled luxury resort site. The dining room is operated restaurant style and very elegant with great vistas. Rental includes meals and weekly housekeeping. There are also resident laundry areas as well as fitness and exercise areas. Staff are on duty 24 hours a day to help residents. Assisted living services are available. Activities are plentiful and the residents seemed active and involved when I visited. When I got to the facility I was surprised by its location and beauty. It's mounted in the rocky granite dells of Prescott, Arizona. It is a beautiful place barely away from all the noise and busy parts of the city. It is very clean and kept up nice. I enjoyed seeing how pleased people living there seemed. My sister even said it was a great place to work at because everyone was friendly, caring, and considerate. The people living there seemed pleased and enjoyed living there. It is a place that makes you feel at home. Granite Gate Senior Living is a place someone can call home where you can be helped and feel safe and secure. It is also in a nice location near a beautiful place full of nature. I would definitely recommend Granite Gate Senior Living to anyone near the area that is considering assisted living. This is a beautiful senior resort type facility. They have independent, assisted, and memory care. they have studio, one and two bedroom spacious fully equipped apartments for independent, These are sunny and airy with sliding glass doors onto a balcony or patio. The assisted have partial kitchens. These apartments are handicapped equipped and have an emergency call system. They also have a secured memory care unit. They offer linen service and housekeeping weekly and as necessary for assisted. In side the main building is elegantly decorated with paintings and statues. 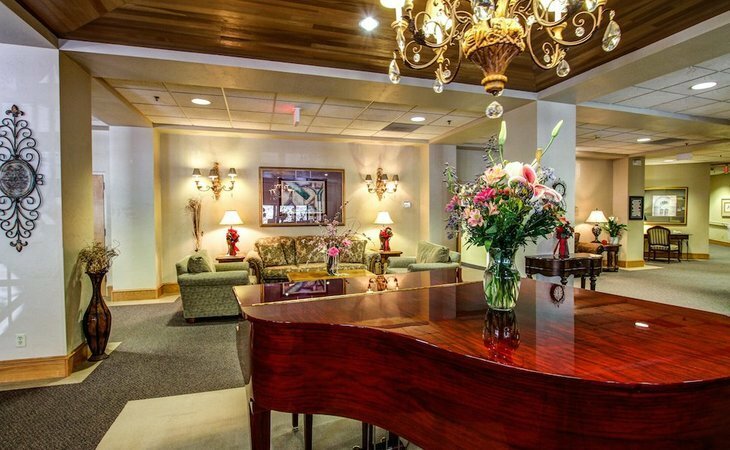 They have a lounge with a grand piano, other lobbies and lounges with fire places, a library, fitness center, billiards room,activities room, computer room, a formal and private dining room. They serve three meals restaurant style and snacks available in the formal dining room. They have a beauty salon and barber shop. They have nurses on duty and on call. They have certified caregivers, an activity department and therapists. They offer transport for appointments. The staff seems competent and caring. All residents are checked on every few hours or more. The grounds are beautiful with courtyards with walking paths, flowers, rock formations, sitting areas, and greenery. There are great views of the tall pines and mountains. They are very active offering one on one for the memory care residents. They have theme parties, live entertainment bingo and other games, fitness programs, and many other options. They do a lot of planned outings to shopping, museums, restaurants, and cultural events. This is a great facility. This was literally like walking into a fine resort! Absolutely breathtaking views of the mountains and an absolutely huge walk-in area. My favorites, if I can try to limit them, were the library, larger than any other facilities I'd seen thus far. Two gentlemen were both in the library, a table apart, deep in reading. I felt that many of the residents here were still very active and preferred more fitness and recreational things than just sitting and watching television. In fact, when my mother and I toured Granite Gate, I never spotted anyone watching t.v., though I did notice residents using computers. While there, a social gathering was just beginning. I'm not sure if it was bingo or bridge but about 15 women were together and their laughter was uproarious. My mom really liked the idea that if all of her daughters (there are 3 of us) and all of our kids came to have dinner with her, they offer a private dining room. We definitely felt like it was more resort-type living. I noticed staff members throughout the tour, laundry service people and most seemed friendly, although busy with work. Another thing I noticed, as my mother and I were leaving and heading back to my car in the parking lot, residents were using their balconies. I remember looking up at one and a gentleman waved. I try not to go into a facility with any expectations, but this particular place actually blew my expectations away. Very well kept, clean and elegant. Friendly staff and residents actually using the amenities offered to them. We weren't really happy with Granite Gate, although it was a beautiful facility. My husband stayed there for about three months and was very dissatisfied and unhappy. It was just difficult. The staff was fine with me and very accommodating. They tried to be helpful. If I had to spend the night there, I'd end up sleeping on the floor, but they'd get provide breakfast for me. He had a nice one-bedroom with a nice, fake fireplace in the living room. They had a library but didn't have many activities to keep the people busy. Hi MP, we're sorry to hear about your experience at one of our competitors. Hopefully your experience at Highgate Senior Living has been better. I'd like to believe you're finding our activities more engaging and that you're not having to sleep on the floor. :) If that's not the case, please let us know! Granite Gate is nice and clean, and they have a nice dining room that the residents can go down to. My friend has a 1-bedroom studio there, which is adequate, and she has a little patio. We were able to have lunch there and the food was fine. Everybody was very friendly. I would recommend it to anyone who needs it. They have activities like card games, movies, and so on. Granite Gate seemed very nice, but it was on the expensive side. It was a multi-level, so my friend was concerned about having to take an elevator to get anywhere. The environment was beautiful, and the amenities looked very nice. We met with the activities coordinator and reviewed the calendar of events; they seemed to have quite an active activity schedule. My sandwich was very nice there, but my friend's salmon was kind of dry, so we thought maybe that was because we were eating just before they closed the dining room for lunch. We didn't meet any residents except to say hello in the hall, but the staff we met was very nice. If we could afford Granite Gate, it might have been our selection. Granite Gate Senior Living was very nice, and the gal who gave us the tour was very informative and very nice. Everyone was just wonderful, and we were very impressed with the place. It was located right in the middle of the garnite rock formation. It used to be a resort before one of the senior living corporations bought it. So, it had absolutely beautiful surroundings. It's a very active senior center, and they were very interactive with the people that live there. They had exercises, music programs, arts and crafts, shuttle services, and shopping tours. Granite Gate Senior Living was quite good, but the apartment seemed small, not too sunny and bright, and not too cheery. The staff was quite good, but the place was too expensive. My husband is in the independent living of Granite Gate Senior Living. I think he is quite pleased with it. They just had some changes in personnel and management, but I think they are getting that together. The staff is quite friendly, and that was what impressed us most about it. It is clean. He has a one-bedroom unit that has a nice view, a patio, and a small kitchen. They have three meals a day. I think the kitchen is open all the time. The food has been very good. We are satisfied with it. It met our needs. Granite Gate Senior Living offers compassionate senior care in Prescott, AZ. We strive to create a home-like atmosphere where you and your loved ones can feel secure. Our warm, well-trained staff works closely with our residents to provide the utmost care and comfort. 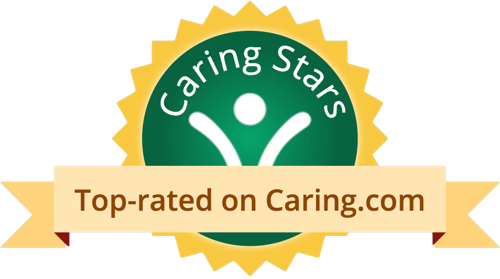 As part of the Five Star corporation, you can be sure that everyone at Granite Gate Senior Living shares the Five Star Values, and is committed to a high level of caring in all that they do. Please schedule a visit to see why we are the first choice in senior care in Prescott, AZ. What should caregivers and potential residents know about Granite Gate Senior Living?